Today I would like to talk about another Adenium Rootstock style with large size. Most people think that most of Adenium Rootstock have round shape caudex and root spread but this style is followed by Bonsai Style with many spiral roots around caudex. 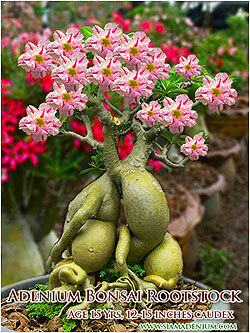 Not only nice caudex and root, branches are also followed with Bonsai class. That means we need to know the branch position to do the grafting in order to make her more beautiful in every angle when flowers are fully bloom. We have many rootstocks with this style. The most popular now is to graft these rootstocks with Rosy Adeniums. We provide this grafting service with your own flower or variety selection to graft with this kind of rootstock. Most of our Rootstock is over 10 years and 12-15 inches caudex diameter so this would make caudex skin look antique and very classical. Remarks : Photos after grafting with Rosy Adeniums are just model to help you more understanding the form after grafting and full blooming. All of Rootstocks shown in here are available, you can select ones of these and let me know which flower you would like to graft her. More questions, please email me.